I am going to be real here. My house isn't always spotless. I know. GASP! Sometimes, the mess honestly makes my head spin! But most of the time, I'm OK with it. My kids are busy growing, learning and making memories. They are happy. So, it's all good. I just make sure to keep plenty of Bounty Basic paper towels and an arsenal of my favorite cleaning supplies from Lowes on hand, to clean it all up after they've been tucked into bed at night! Once everything has been scrubbed clean and put away, I love to up-cycle/incorporate all of the empty paper towel tubes into fun craft projects for the kids. Recreate the beautiful Fall scenery with this fun kids craft! Use washable non-toxic brown paint to hand print/paint the branches (hand print) and tree trunk (forearm). 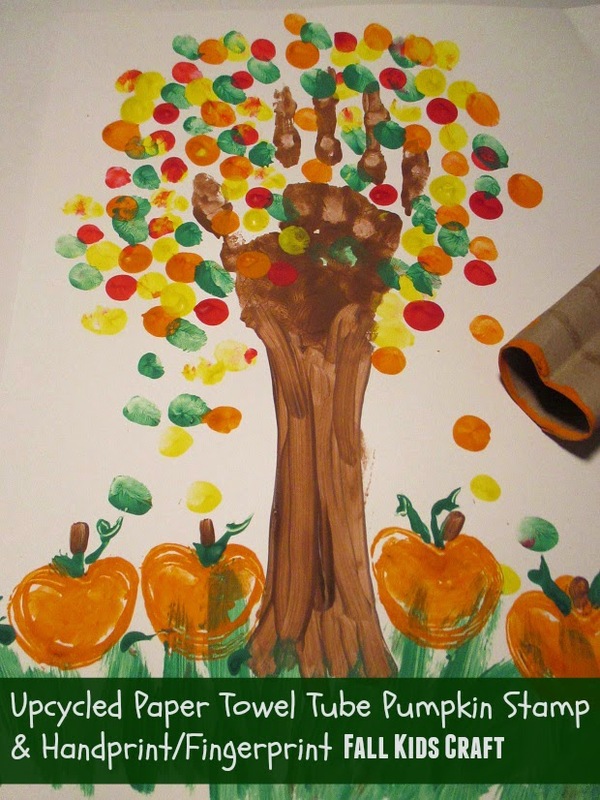 Next, make fingerprint "leaves" on the hand print tree branches in various colors (red, orange, yellow, and green). Using a brush or fingers, create grass around the base of the tree. Next, cut a paper towel tube in half and pinch the center of the tube to form a heart shape with the tube, Dip the end of the tube in orange paint and stamp on the paper around the base of the tree to create your pumpkins. Fill in your pumpkins using a paintbrush or finger paint. These adorable upcycled paper towel tube Hand Print Turkey Thanksgiving centerpieces are so easy to make! They are sure to stay put on your Thanksgiving table too with an easy to make weighted center. Simply cut your paper towel tube in half. Cover the tube in gold or brown duct tape. Cover the bottom of the tube with duct tape as well (leave the top open for the next step). Pour about a quarter cup of uncooked dry rice into the center of the tube. Cover the top of the tube with duct tape. Next, trace the outside of your child's hand on yellow, red, orange and brown construction paper (3 hand prints in each color). Cut the hand prints out using safety scissors. Fan the hand prints out and glue them in alternating colors to your covered & weighted paper towel tube. Next, glue two googly eyes to your covered paper towel tube. Cut out a "gobbler" using excess red construction paper and a beak for your turkey out of the excess construction paper (in a color of your choice). 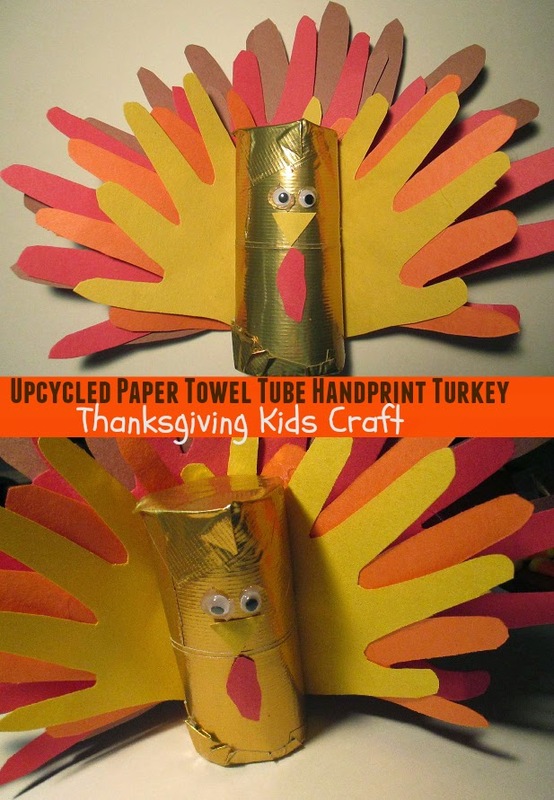 Glue your gobbler and beak to your paper towel tube hand print turkey. Allow adequate time for glue to dry. Happy Fall & Happy Crafting! Ready for some more Fall DIY creative inspiration? Head over to PopSugar to see DIY guru Brooke Peterson tackling more fun Fall DIY projects. I am definitely going to have to give her Fall welcome mat tutorial a try - seriously SUPER CUTE! Feeling creative yet? What Fall project would you like to tackle this season? Need some supplies to get started? We have a $100 Lowes Gift Card to give away to (1) One Savvy Mom reader! Disclosure: Our thanks to P&G for providing a gift card for review/feature purposes and for providing a gift card for giveaway purposes for (1) One Savvy Mom reader. All opinions expressed are our own. I would like to decorate the clear vase I have with stencil paints for the autumn. I'd like to power wash our porch and decorate it with fall items. I want to put out the Fall decorations on the front porch with my Fall lawn furniture. I need to put out my Pumpkins and hanging Fall sign! I'm looking forward to reorganizing my closet and adding more shelving for my fall/winter clothing. every fall i reorganize my closets, and update all the pictures in my house! ty for the chance to win! I would like to paint our front door, and decorate for fall. I would love to decorate for fall. I still haven't done much. I want to paint my bathroom. Right now I have to fix the hole that the dog just put in the wall yesterday when he pulled the gate down where it was anchored into the wall with 3 screws and wall anchors. Big mess. I would love to paint the bedrooms in my house. We make paper towel bird feeders for the migrating birds. The mature homeowner in me wants to weatherproof and add a storm door. The fabulous part of me wants to do an entryway project with beadboard or a planked wall. I would like to make a wreath from leaves and branches around my home. My kids enjoy making turkeys out of pine cones too. I'd like to get new, better insulated windows for our back room that leads onto the patio. I want to do a deep clean of carpet and rugs. I would love to redecorate my living room a bit!! I want to re-paint my bathroom. I would like to redecorate my living room. I am wanting to make a new thanksgiving wreath for my front door. I cannot wait to paint my deck before the snow arrives. My fall do it yourself that I want to get done is to paint the shed! Hopefully before the snow flies! We are tackling stripping and refinishing my daughter's furniture. She has had it since she was toddler and was using other furniture, but now wants this back. We are moving into a new house soon, so I can't wait to get started on painting the walls. Replacing my kitchen faucet. Mine has been leaking forever. I am looking forward to organizing our garage! We need to get up and clean out the gutters! Cleaning the garage, painting and putting up shelves. I love the toilet paper roll turkey! Fall project cleaning out the backyard! We have a big turkey day with a lot of people. Its a hot mess right now! i need to get the sides of my house cleaned up and prepped for next year. Next year I want to finally get some flowers growing and weeds kept at bay. I would like to make a wreath for my front door! Probably something with leaves. We are finishing our sunroom to make it a family room. I cannot wait to get it done! Almost there. I would love to tackle removing the 1970's wallpaper in my mother's kitchen and doing some much needed painting. I would like to repaint my living room. We are planning on powerwashing the deck and repainting it! I would love to paint my master bedroom, Thank you! We are going to replace our front door, but I want to wait until it is freezing so there won't be swarms of bugs coming indoors while the door is down for an hour. I am looking forward to cleaning the outside of my house. We need to retile our shower! I would love to build a lamp using a large branch that was cut down in yard. We're redoing the bathroom walls. I'd love to paint my bathroom vanity and maybe try one of those granite paint kits to give the counter a makeover! I would like to organize my kitchen.